The Fast Track Stream is intended to be a faster and cheaper process for straight forward disputes in the South Australian District and Supreme Courts. However, since commencing in October 2014, relatively few practitioners have elected to use the process. This research investigates litigation practice in the Fast Track using empirical and doctrinal research methods. Data collected from practitioner interviews suggests that their decision to use (or not use) the Stream reflects issues relating to: knowledge of the Fast Track; perceptions of case suitability; and opposition to using the Fast Track. Although interviews were conducted with a small number of practitioners, their accounts and perceptions suggest a generally positive experience of the process, offer insight into the challenges of implementing similar procedural reforms, and form a basis for recommendations for the future of the Fast Track. The recent New South Wales Court of Appeal decision in Stealth Enterprises Pty Ltd t/as The Gentlemen’s Club v Calliden Insurance Ltd canvassed complex issues surrounding an insured’s duty of disclosure under the Insurance Contracts Act 1984 (Cth). This article explains the ramifications of this decision for insurance lawyers and the insurance market, and analyses the Supreme Court’s decision that was overturned on appeal. The article provides practical guidance for insurers and insureds about the application of ss 21 and 28 of the Insurance Contracts Act and how the Stealth litigation has affected disclosure under these sections. This article focuses on the everyday legal problems of Canadians in the context of consumer purchases of products and services. An everyday legal problem is a problem arising out of the normal activities of people’s daily lives that has a legal aspect and has a potential legal solution. The discussion begins by introducing meaningful access to justice as a conceptual approach for thinking about everyday legal problems, followed by an assessment of how meaningful consumer protection mechanisms in Canada are for helping to resolve the consumer problems Canadians actually have, drawing on new survey data from the Canadian Forum on Civil Justice. 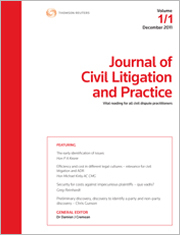 For the PDF version of the table of contents, click here: JCivLP Vol 6 No 3 Contents.